Links: 56 Drive Link. 1 Guide Bar. 1 Saw Chain. Color: As Pictures Show. Suitable for cutting rough construction lumber and semi-finished lumber from any log. BEFORE YOU ORDER CHECK YOUR CHAIN PITCH AND GAUGE MATCHES WITH THOSE BELOW, YOU CAN FIND THE DETAILS ON THE OLD BAR OR ON THE CLUTCH SPROCKET ! CHAIN PITCH = 3/8". BAR SIZE = 20". 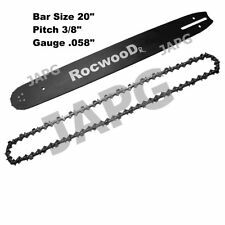 .063" Guide Bar Saw Chain 72DL For Stihl MS361 MS362 MS390 Chainsaw 20inch 3/8"
Saw Chain 1 Saw Chain. 1 Guide Bar. Driver Link: 72 DL. Color: As Pictures Show. Stihl part no. 017, MS170, MS171. Stihl part number for information only. 14" GUIDE BAR & 2 CHAINS. BAR 2 CHAINS. BAR SPRACIFICATION. CHAIN SPECIFICATION. 3/8 LP . 050 / 1.3mm 50. 35 cm / 14". This item is brought to you courtesy of JAPG MOWERS AND MACHINERY, based in Herefordshire in the UK. Just type in "JAPG MOWERS" into Google and you will easily find us. Part 501 44 44-01, 501 44 45-01, 501444401, 501444501. Bosch AKE35-19S, AKE40-19S, AKE40-19PRO, AKE-35-18S, AKE 40/17s, AKE35, AKE30S, AKE36S, AKE30-19S. Makita DCS 34, DCS330, DCS340, DCS341, DCS390, DCS400, DCS401, 5012, 5014, 5016, UC3500, UC3501, UC3020A, UC3520A, UC4020A. FOR MODELS WITH 3/8" PITCH AND 1.5mm. 058" GAUGE CHAIN AND SPROCKET. 029, 034, 036, 038, 039, 044, 046, 048, 056, 064, 066, MS290, MS310, MS311, MS340, MS341, MS360, MS361, MS362, MS380, MS390, MS391, MS440, MS441, MS460, MS461, MS640, MS650, MS660 and MS661. A quality non genuine 20" guide bar to fit the following Stihl chainsaw models. CHAIN PITCH = 3/8". BAR SIZE = 14". CHAIN GAUGE. 050". 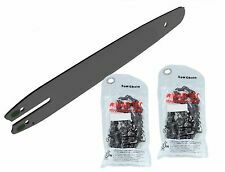 Chainsaw Guide Bar 3/8 LP 50DL Saw Chain for Stihl MS170 MS180 MS250. MS170, MS180, MS181, MS190, MS191T, MS192T, MS200, MS200T, MS210, MS211, MS230, MS250, 017, 018, 020, 021, 023, MS171, MS193T, MS231, MS251, 025. FOR MODELS WITH. 325" PITCH AND 1.3mm. 050" GAUGE CHAIN AND SPROCKET. CHAIN PITCH = 3/8". BAR SIZE = 16". CHAIN GAUGE. 050". This guide bar will fit the following chainsaw when fitted with a 3/8". 058 (1.5mm) 84 Drive Link chain. Husqvarna: 61, 65, 66, 70, 77, 160, 162, 181, 185, 260, 266, 268, 272XP, 281, 285, 288, 298, 365XP, 371, 372XP, 380, 385XP, 390XP, 394, 395XP, 480, 562XP, 570XP, 575XP, 576XP, 1100, 2100, 2101 and 3120XP. Stihl part no. 017, MS170, MS171. Stihl part number for information only. 14" GUIDE BAR & 1 CHAIN. BAR 1 CHAIN. CHAIN SPECIFICATION. BAR SPRACIFICATION. 3/8 LP . 050 / 1.3mm 50. 35 cm / 14". Chainsaw guide bar for Husqvarna 2 chains. Features: -High quality Chainsaw guide bar for HUSQVARNA. -Husqvarna 136,137,141,142,50,51,55,340,345,350. -2 Chains included. HS1-HS9-IV41-IV56-KA27-KA28-KW15-KW17-PA20-PA41-PA49-PA60-PA78-PH42-PH44-ZE1-ZE3, Scottish Highlands & Islands Northern Ireland Channel Islands Other UK Islands any overseas countries. To sharpen the chain requires 4mm round file. is a quality Archer item. A 12" guide bar and semi chisel saw chain. The length of the guide bar is the effective cutting length and not the overall length of the guide bar. Partner, 335, 345, 285, 395, 405, 330, 340, 360, 365, 351, 370, 390, 420 & 350. Chain Spec: 3/8 LP. 050 45 DL. Application Guide. Husqvarna, 23, 36, 41, 136, 141 & 243. Poulan, 20, 25 Series, 180, 190, 200, 205, PP210, 225, 235, 250, 255, 260,PP260, 285, 295, PP295, PP300E, 305, 306, 310, PP310, 325, 335, PP335, 336, PP380, 523, 1220, 1425, 1625, 1800, 2000, 2050, 2100, 2150, 2250, 2300, 2350, 2375, 2400, 2450, 2500, 2550 & 2600. To sharpen the chain requires 4mm round file. 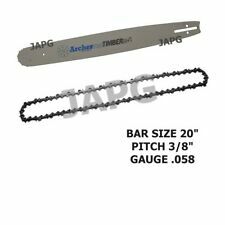 A 14" guide bar an Archer semi chisel saw chain. The length of the guide bar is the effective cutting length and not the overall length of the guide bar. A 14" guide bar an Archer semi chisel saw chain. The length of the guide bar is the effective cutting length and not the overall length of the guide bar. To sharpen the chain requires 4mm round file. STIHL: HT70, HT75, HT100, HT101, 017, 019T, MS190, E140, MSE160, MS170, MS171, MSE180, MS181, MS191T, MS192, 009. MS170, MS210, MS211, MS230, MSE140, MS160, MS250, MS180, MS192 and many other. 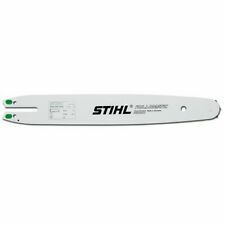 High quality Chainsaw guide bar 2 chains for Stihl. Husqvarna Chainsaws. Fits Husqvarna Models. 72 Drivelink x 325". BAR Chain. (FOR ORDER PLACE BEFORE 9AM). Stihl part no. 017, MS170, MS171. Stihl part number for information only. 14" GUIDE BAR. BAR ONLY - NO CHAIN. BAR SPRACIFICATION. 3/8 LP . 050 / 1.3mm 50. 35 cm / 14". (FOR ORDER PLACED BEFORE 9AM). Husqvarna; 33, 38, 40, 42, 44, 45, 49SP, 50, 51, 52E, 55, 133, 136, 140, 141, 154, 234, 238, 240, 242, 246, 254, 257, 259, 261, 262, 335, 340, 345, 346XP, 350, 351, 357, 359, 362, 370, 380, 410, 420, 425, 435, 444, 450, 451, 452, 455, 490, 510, 520, 521, 525, 535, 590, 2035, 2036, 2041, 2044, 2045, 2050, 2051, 2054, 2055, 2059, 2063, 2141, 2145, 2149, 2150, 2159, 2163, E2012, E2014, E2015, E2016, EL14, EL16, EL1200, EL1400 & EL1600. Is a quality Archer item. A 16" guide bar and semi chisel saw chain. The length of the guide bar is the effective cutting length and not the overall length of the guide bar. To sharpen the chain requires 4mm round file. (Compatible With: fit for STIHL 017 018 020 021 023 025 MS170 MS180 MS181 MS190 MS191T MS192T MS200 MS200T MS210 MS211 MS230 MS250 Chainsaw. 2) Perfect match for the original one. Photo Show. Condition: 100% new. Chain Spec: 3/8 LP. 050 45 DL. Application Guide. Husqvarna, 23, 36, 41, 136, 141 & 243. Poulan, 20, 25 Series, 180, 190, 200, 205, PP210, 225, 235, 250, 255, 260,PP260, 285, 295, PP295, PP300E, 305, 306, 310, PP310, 325, 335, PP335, 336, PP380, 523, 1220, 1425, 1625, 1800, 2000, 2050, 2100, 2150, 2250, 2300, 2350, 2375, 2400, 2450, 2500, 2550 & 2600. 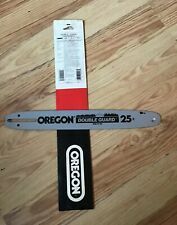 This non genuine 15" guide bar fits Stihl models 024, 026, 029, MS240, MS260, MS270 and MS290 chainsaws. 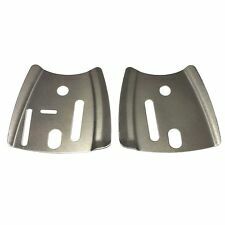 Similar To Part Number: 3003 000 6811. Is a quality Archer item. 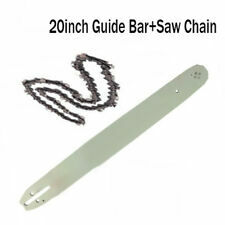 A 12" guide bar and semi chisel saw chain. The length of the guide bar is the effective cutting length and not the overall length of the guide bar. To sharpen the chain requires 4mm round file. Husqvarna: 38, 40, 40P, 41, 42, 44, 45, 49, 50, 51, 55, 57, 133, 136, 137, 140, 141, 142, 154, 234, 235, 238, 240, 242XP, 243, 246, 254XP, 254G, 257, 261, 262XP, 262XPG, 336, 339, 338, 340, 345, 346XP, 350, 351, 353, 357XPG, 359, 360, 362, 365, EL16, EL1400, EL1500, EL1600, EL1200, 40S, 55 Rancher, 435, 440, 444, 445, 450 Rancher, 460 Rancher & 570. A 16" guide bar and semi chisel saw chain. The length of the guide bar is the effective cutting length and not the overall length of the guide bar. To sharpen the chain requires 4mm round file. The guide bar is similar to Oregon Part No: 160SPEA074, 160SXEA074 & 160SDEA074. 017, 018, 020, 021, 023, 025, MS170, MS180, MS181, MS190, MS191T, MS192T, MS200, MS200T, MS210, MS211, MS230, MS250. 16" Guide Bar for Stihl 017 023 025 MS170 MS180 for 55DL 3/8LP. 050 Gauge Chain. 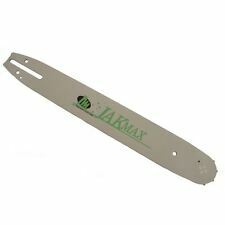 16i nch Guide Plate fits for Stihl chainsaw with 55DL 3/8"LP. 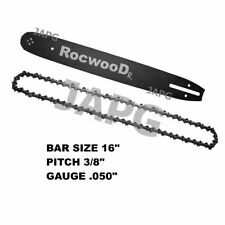 050" Gauge Saw Chain(Saw Chain is Not included). Stihl 017, MS170 and MS171. Chainsaw Specification: 3/8 LP 0.043 50 Drive Links. is a quality Archer item. A quality non genuine 14" guide bar to fit the following makes and models Part Number. Saw Chain 1 Saw Chain. 1 Guide Bar. Color: As Pictures Show. Driver Link: 72 DL. Notes: The real color of the item may be slightly different from the pictures shown on website caused by many factors such as brightness of your monitor and light brightness. Husqvarna: 33, 36, 40, 41, 42, 44, 45, 49, 50, 51, 55, 57, 124, 133, 134, 136, 137, 140, 141, 142, 154, 234, 235, 238, 240, 242, 242XP, 246, 254, 254XP, 257, 261, 262, 339XP, 340, 345, 346, 346XP, 350, 351, 353, 357, 357XP, 359, 360, 362XP, 435E, 440E, 444, 445E, 450, 450E, 455, 455E, 460, 545, 550, 550XP, 555, 560XP, EL16, EL1400, EL1500, EL1600.